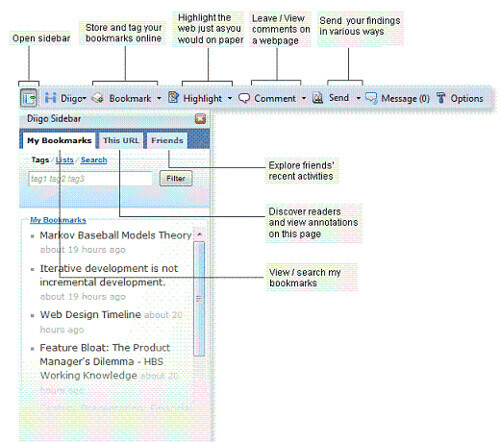 Bookmarking is quite simple with Diigo. Click here to watch a short video clip. Recommended Tags, Add to List / Group, Share with friend, Twitterthis ~ just to name a few ~ all these are just one click away within the new bookmarking window! 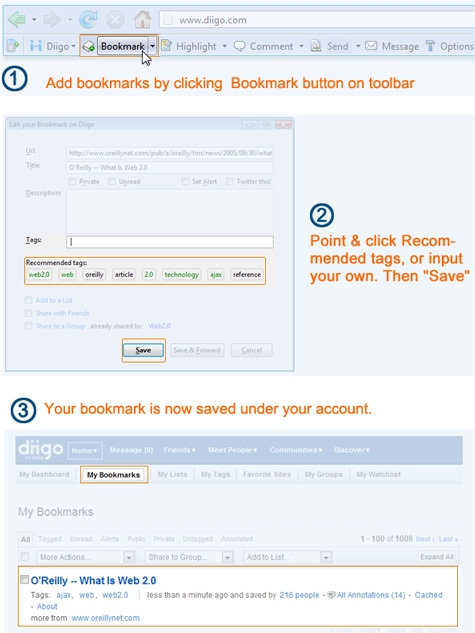 To learn more about various bookmarking options in Diigo, plesae visit our new “Bookmarking Help” page. Before we begin, please make sure you’ve installed the latest toolbar from the Diigo toolbar download page… Although our system should auto-update if you have previously installed an earlier version of the diigo toolbar, you can double check whether you have the latest one by looking up your toolbar version # (in toolbar: Diigo >> Help >> About) against the version number on the main Diigo toolbar download page. Note: a few users have reported sign-in problem. Most likely it’s due to the fact that somehow your system prevents a proper auto-update. If that’s the case, we’d recommend that you re-install the latest toolbar. You should be in good shape after the re-install. If not, please let us know. This replaces the earlier version of the Diigo button that carried out dynamic functions. Each function now has its own button for a more intuitive user experience. We will elaborate more on each of the functions in other tips in this series. When you’re ready to bookmark a page, right-click, and you will see “Bookmark this page” to Diigo. Of course, don’t forget about the sometimes overlooked, but very, very useful diigo “Content Selection Menu” – which we will cover in a separate tip in this series.